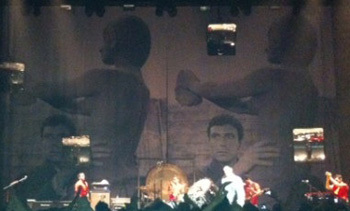 The image on the bass drum's skin was a cropped detail of Italian actor Anthony Franciosa's head from the image also used as a backdrop (see 'Backdrop' below), with the word "Arthounds" in white tape over it. 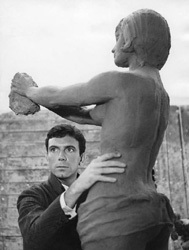 A black and white image of Anthony Franciosa from the 1962 movie "Senilità". View original and in situ (better in situ image needed). Here is the number of times each song was performed on this leg, in descending order of frequency. This is based on 18 concerts. "Satellite Of Love" from the Las Vegas concert was released as a single in 2014.